Refereeing is an art in itself. Some people are cut out for it and most people should probably steer clear of it. There’s an official rulebook but the interpretation of same can vary greatly from one referee to another. One could be reading the rulebook all day long but true knowledge of the rules can only be acquired within the context of reacting to situations over and over again on the football field. It’s not as if a referee can say to himself before the start of a match, “I’m going to do this one a particular way,” or “this is going to happen today,” because one never knows what kind of incidents, mistakes, slip ups or scenarios may present themselves as the story of the match unfolds. Every competitive fixture is a journey into the unknown for the man in charge and therein lies the buzz, the butterflies, the adrenalin rush, the excitement, the sense of anticipation. It doesn’t matter whether it’s a Primary Schools Girls Final or a County Men’s Senior Championship Final, the feeling never changes, and over the years I have never grown tired of it. Refereeing has kept me young, alive, relatively fit and above all, involved. It has given me a sense of belonging and a longevity in the wonderful world of Ireland’s greatest sporting organisation. It has never been a power trip but always a privilege and I will miss it dearly whenever the final whistle blows on my modest contribution. My refereeing journey began in London in 1973 at a Junior League game between Taras and Young Irelands. The appointed referee never showed up (a common enough occurrence in those days) and I was asked to officiate. 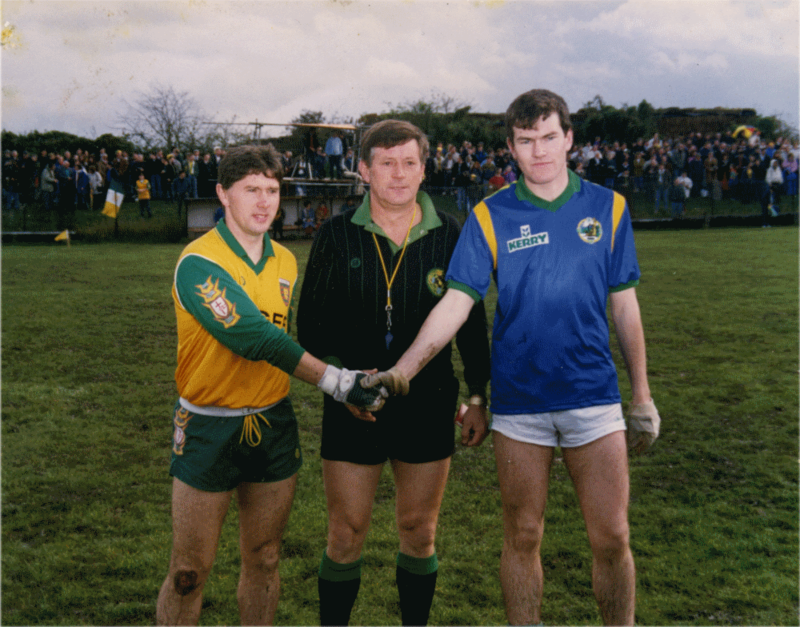 I had a small bit of experience under my belt having refereed a few challenge matches involving my own club at the time, namely Treaty Gaels, so I felt secure enough in myself to step in. Thankfully the contest itself was a free flowing one devoid of any incident so I left the pitch feeling upbeat and positive. Before the week was out I was approached formally by a representative of the London County Board with a view to coming on board officially. I was honoured to be asked and happy to help out. Once I got a couple of referees’ seminars under my belt I felt more accomplished and confident in my own ability. There’s nothing like training and education to bring a person on in whatever course of action we choose to embark on, and refereeing was no different. I became a regular attendee at the London Referees Monthly Meetings and it was this experience that really taught me the value of the old saying, “a problem shared is a problem halved.” We all drew great strength from each other at these get-togethers and I quickly came to realise that to be a knight of the whistle was to be bestowed a vocation within a vocation so to speak. It was something to be developed, to be evaluated, to be monitored, to be reviewed and refined but ultimately to be cherished, to be appreciated and above all to be protective and proud of. Remembered by Stephen Thomas Kane and written by Paul Gannon. Stephen Thomas Kane was a native of the townland of Ardnagreevagh, on the Renvyle Peninsula, in the Parish of Letterfrack- Ballinakill.